In 10-inch nonstick skillet, heat oil over medium heat. Add chicken, taco seasoning mix and water; stir until well coated. Cook uncovered 4 to 5 minutes, stirring frequently, until chicken is heated through. In small bowl, stir together beans and chiles. Place tortilla on work surface, and spread about 3 tablespoons of the bean mixture in middle of tortilla. Top with about 1/4 cup of the chicken and 2 tablespoons of the cheese. Fold sides of tortilla in. Fold bottom over filling and sides. 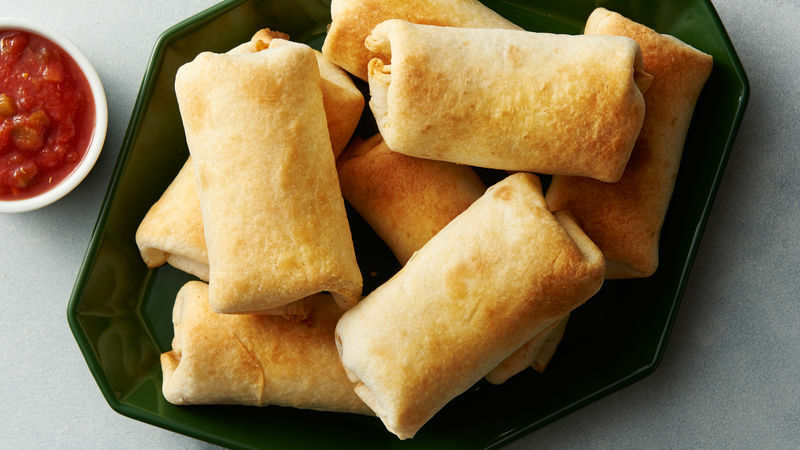 Roll tightly to enclose filling. Repeat with remaining tortillas. Brush outside of each filled tortilla with melted butter; place 4 in basket of air fryer, seam side down. Set to 400°F; cook 4 minutes. Turn; cook 2 to 3 minutes or until lightly browned and heated through. Repeat with remaining 4 filled tortillas. Use care when filling and assembling tortillas. Expect them to be full.